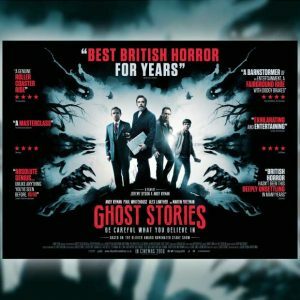 The hit Brit horror film GHOST STORIES has just become available to buy on DVD and Blu-ray. Andy Nyman, the film’s writer, director and star, originally hails from Alchemy’s hometown of Leicester. So we despatched our resident horror fiend, Gavin Baddeley, to talk to Andy, and get the inside story on this homegrown chiller. Andy co-created GHOST STORIES with Jeremy Dyson, who together initially wrote it as a stage play. 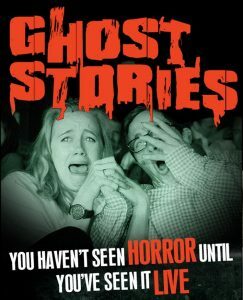 In that form GHOST STORIES attracted rave reviews, running for over 1,000 terrifying performances between 2010 and 2015, concluding with an Australian tour the following year. Previous to GHOST STORIES, Jeremy was best known as the silent partner on the cult BBC black comedy THE LEAGUE OF GENTLEMEN. Andy is an accomplished stage magician – specialising in the psychological illusions known as mentalism – and co-wrote many of the TV magic spectaculars starring Derren Brown. He was originally approached to front them himself, but declined, preferring to focus on his acting career. ANDY NYMAN: I hated it – I was really, really scared of it – I couldn’t bear horror films when I was a kid. I couldn’t even listen to any of the music if it was on TV. It was my sister who really scared me when we watched an episode of THRILLER on ITV one night. My sister’s older than me and always loved horror, and she said “it’ll be fine, it’ll be fine”. I was about 7, and I didn’t get past the titles. Literally, just that opening theme, and I was out. And I was very scared of horror between that age and when THE FOG came out. 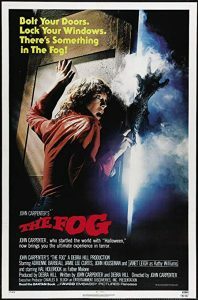 I went to see THE FOG with my sister – I was fourteen – because she said it’s an AA certificate, so it won’t be scary. The rest of the family were going to see FLASH GORDON at the ABC in Leicester. I thought, “Okay, I’ll go, because it won’t be scary because it is just an AA, and horrors are Xs, so I’ll be fine”. How wrong was I! It absolutely terrified me, but I loved it. Really loved it, became addicted, and since then it’s been a lifelong obsession. I still subscribe to Fangoria, to Starburst – I’ve kept up all those things – I love it. GAVIN: GHOST STORIES began as a play, and I’m very interested in the idea of theatre as a medium for horror. I think it’s potentially more effective than cinema in a way. Partly perhaps because a lot of the people who go to see horror plays aren’t used to theatre. Maybe that gives it an immediacy and an unfamiliarity, which gives it extra impact? AN: Horror in the theatre has an incredible history – don’t forget Dracula was born in the theatre, then there’s the Grand Guignol – an incredible history. There are two things that are incredibly exciting about horror in the theatre. The first is exactly as you say – that it is alive, and real, and there happening in front of your eyes. And the unfamiliarity is a brilliant gift because, especially with GHOST STORIES we brought in an audience that does not go to the theatre. That was an amazing statistic for us, really exciting. But even with regular theatregoers you know the game that you’re playing is very different to a normal play, because you know 80 percent of the audience are coming in thinking “F**k off, how scary can this be? It’s just a play.” They know a horror film can scare them. They understand what that language is. They understand they just cover their eyes, look away, or whatever it is, if they don’t like it. In a theatre it’s so much more dangerous. The way we did GHOST STORIES was slightly immersive as well. You’re walking into that world – you can touch it, smell it – and that really leaves you jangled in a good way. That’s a great game. We loved that. It was a scary game to play because we risked a lot by betting that this was all really going to work – and who knew? – but that’s part of the fun of it. 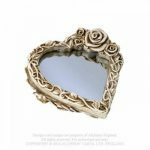 GB: Did you actively use any of the magic techniques you learnt through mentalism for GHOST STORIES? 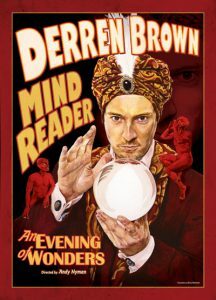 AN: We did, yes, though not so much the mentalism as the rhythm of magic, the magical thinking, the idea of having threads that you draw together, the work I’ve done with Derren Brown. Horror and magic live so comfortably together. So I did. I loved employing it and that’s one of the reasons that the effects in the film were all practical and not Computer Generated. Because special effects in films are basically great magic tricks, and what’s happened with CG is that it’s the difference between me showing you a card trick, or me giving you my iPhone and showing you a trick on there. The experience is very different. With CG the audience innately knows there’s no connection. It’s sort of a cerebral thing where you can’t quite identify why, but you know it’s not quite right. Whereas a practical effect hits you in a way because it’s hitting the actor at the same point. Especially on GHOST STORIES, where the characters are seeing what you are seeing, which is very exciting place to be in. Now we’re not Luddites, and CG has amazing uses – it’s brilliant in removals and enhancements and all that sort of stuff. But it’s often a lazy option that stops you thinking and the really inventive stuff is often the stuff that is so exciting. GB: I took my nephew and niece to the York Dungeon recently, and almost the most effective part of it was the bit at the start where you’re waiting to be let in. And in the corner is an actor with their face to the wall, stock still, occasionally rattling a chain, and I thought waiting for something to happen is almost scarier than when anything does. AN: It’s because you’re doing all the work. There’s a great bit in Stephen King’s DANSE MACABRE when he talks about something which he calls something like ‘the ten foot bug philosophy’. Which is when you have a closed door, and everybody’s terrified of what’s behind the door. The second you open the door and show that it’s a ten foot bug, it’s inevitably a relief, because before that it could’ve been anything. The point is it’s a question of when you open the door and how much you let people see. We met John Landis when we were doing GHOST STORIES the play and he became a great friend, and one of the things he said to Jeremy and me was “Don’t show too much!” It’s great advice. But it’s also hilarious that that advice came from him of course, who directed AN AMERICAN WEREWOLF IN LONDON, a film where he showed absolutely everything! GB: Well, I love your work, so keep doing what you’re doing. AN: We start writing the new one tomorrow! 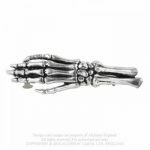 Of course, nobody does spooky chic quite like we do here at Alchemy, and if you’re looking to add a little eerie elegance to your world, we’ve got you covered. 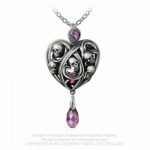 With designs such as the skeletal Get a Grip hair clip (HH9), and the spooky chic or the Ghost of Narcissus compact mirror (V39), or indeed the morbid beauty of our Keepers of the Tyrian pendant (P742).